The Vail / Beaver Creek area is the vacation spot of the west! 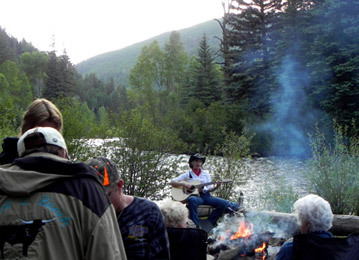 Plan your next vacation in a getaway cabin or visit one of the many ranches the Vail / Beaver Creek area has to offer. Come with the family, plan a romantic getaway, family reunion or corporate retreat. There is a cabin or guest ranch to fit everyone’s needs in the mountains of Vail / Beaver Creek area. Enjoy these majestic mountains from the rocking chair of a front porch, hike the trails, horseback ride, fly-fish, snowmobile or take out an ATV. There are so many things in the mountains and when vacationing at a cabin or ranch the experience is even more rewarding. The Vail / Beaver Creek area is waiting for you, plan an adventure and bring back with you a memorable mountain experience.